There’s a man outside my house using a chainsaw to trim a hedge. This has been going on intermittently for a couple of hours. My property is part of a bigger property, neither of which are mine so I don’t really get a say in what happens around here. My landlord is a very good landlord… that’s one of the reasons I like living here. He wants this place to look neat and tidy, because he’s trying to sell the place and therefore is concerned with how others perceive things. Others who are not me. I like this place as it is. No need to dress it up for me. I like that hedge the way it is, yes, it’s overgrown… that’s why I like it. It hides my house from the road, yes, that makes it difficult for people to find this place, to spot the turn off onto the lane… that’s why I like it. Sure it looks messy… I don’t care if it looks messy, that is just a surface appearance, and if you judge things by their surface appearance then you’re missing what lies beneath. Judge me by my appearance… and you’ll miss what is inside. On the surface, astrologically, I have Virgo rising… so you might assume that I am a neat freak. That not only do I have to look immaculate, but everything around me has to seem as though it is still in its original packaging. Pristine, untouched by human hands or nature or time or dust. Virginal. Sterile and perfect. If that is your take on Virgo… then your interest in a subject such as astrology is a passing cursory glance, driving by a property and judging it by its hedge. Sometimes the surface is all you need to see. It tells you everything you need to know. It gives you a sense of safety and order, things are exactly as they appear to you to be. Surface appearances can also be distressing, and prompt us to jump to a conclusion in which we get stuck because we trust the surface to inform us even when what it is telling us is a sight we don’t want to see. Everything has a flip side. A good and a bad side. It usually has many shades in between those two, where good and bad overlap and are hard to tell apart. That’s why I like astrology. When you delve into it, it shows you both the good and the bad and everything in between. I particularly love the places where things overlap. 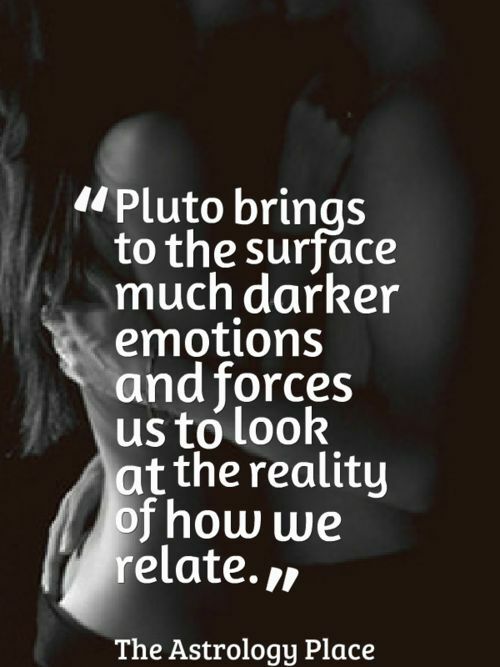 When I was researching the overlap of Pluto and the Sun, I came across an intriguing interpretation of how the two entities interact – Pluto Aspects – Who are you kidding? – the very first words of it – “According to astrologer, Liz Greene, the pretense that Sun-Pluto women will adopt to cover up another, more powerful personality is rather fascinating.” – caught my attention and sucked me in to read the rest of it. In my natal chart Pluto in Virgo in the 1st house, trines my Sun in Capricorn in the 5th house. And by transit, Pluto in Capricorn is close to a conjunction with my Sun. When I first heard the chainsaw outside my house, I experienced a surge of stress… not dissimilar to the surge of power which is required to turn a chainsaw on. I went to the window, looked out to see what was happening, who was invading my territory, my boundaries of peace and quiet, damaging my calm. My reaction to the stress was primal. In a flash of an image in my mind’s eye, I saw myself going outside, ripping the chainsaw out of the gardener’s hands and trimming his head off with it. That’s that. Problem solved. My world would be neat and tidy again. The man caught me looking at him. People always know when you’re looking at them… the sense of being stared at. He smiled and said ‘Hello!’. Was I adopting a pretense, covering up a more powerful personality under the facade of a smile? Should I have let him know that I had just decapitated him and that the smile on my face was perhaps not me returning his greeting but… something else? You just never know… others. You can however get to know yourself beneath the surface. Sometimes the surface appearance is the place where we keep our feet firmly on the ground. It is neat and tidy because it needs to be. What lies beneath is chaotic… and needs its flip side to balance it out. I would never decapitate him. Or anyone else. As far as I know… up to date. I knew I was just experiencing my usual reaction to stress. It would pass. And pass quickly. Or pass slowly… either way. I know myself… well… well enough. I have a Scorpio Ascendant (conjunct my natal Neptune), square my Leo Sun. My Pluto/Uranus in Virgo are conjunct in my 10th (and part of a mutable t-square, oh my). 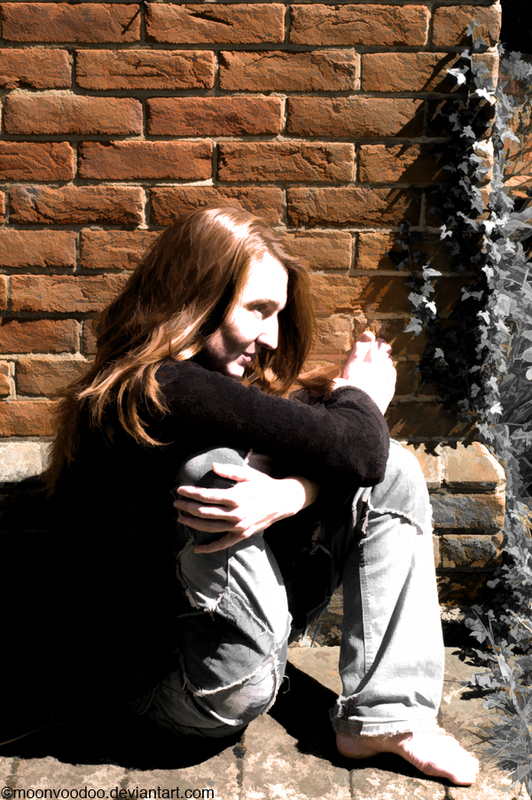 Most of my life I have been completely unable to hide my disdain toward others, although I thought I could and would be consistently bewildered by their strange reactions. Then again, I am a Snake, so people are going to be put off no matter what. I can especially relate to your thoughts on surface appearances and about having murderous thoughts when it comes to yard-workers with loud machinery. So glad to know someone else is out there having the same imaginings. Still, I think of it as a life’s accomplishment if and when I am actually able to croak out something quasi-hospitable to the offender. They are, as you point out, only after their own objectives, just as much as I am. Being able to grasp this is much more than I was able to do when I was younger and grappling with all those emotions awash inside me. I had an intuitive hit while reading this: Capricorn with Sun in the fifth reminded me of Marlene Dietrich. Useful? Not useful? I’ve had Capricorns in my life for 3 decades (not counting the grandparents who I can’t say I knew well) and like seeing how their determination plays out in different configurations. Thanks for the read. Mucking about on the internet on a snow-bound am in the USA. I like to keep in mind that whatever I think or feel about someone, they may be doing the same about me, which tickles my humerus. Then again most people tend to be thinking about themselves and if they think about you it is to wonder what you are thinking about them, and you’re probably doing that too. Being human is a funny affair! If he was actually using a chain saw that is pretty radical – and reason for concern. But if it is just a hedge trimmer – just turn up the stereo and don’t think about it too much. They do gardening differently in these here parts 😉 In this case the chainsaw was needed because the hedge was getting more than just a trim, it was being cut right back, which meant cutting through very thick branches. Usually this hedge gets a yearly ‘trim’ from the local farmer using a tractor specifically equipped to deal with all the different plants that make up the hedges. It’s best to take cover when that happens! interesting.. next up- research on Pluto. I really enjoyed reading this. I am another, like you who values their privacy, resenting interlopers of all shapes and sizes. I have been known to explode when the guy down the road roars past on his unnecessarily loud motorbike, when the local kids scream and holler outside my house and when the weekend comes…. don’t get me started on lawnmowers, chainsaws and every other power tool which surface the instant the weekend arrives! 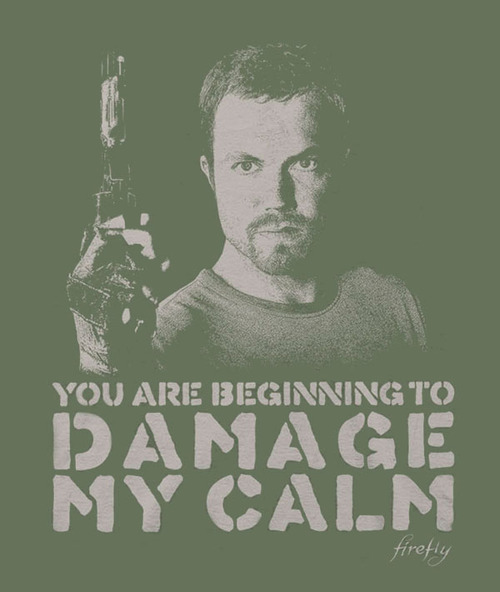 Now, I will remember that quote from Firefly and take that as the moment I choose; either head out with a shotgun or take a breath and deal with my stress *wink* Great post, and I hope all is calm once more in your world. Gotta love Firefly! I have to admit that I’m like Jayne. Guns blazing temper wise… and then ask questions later once I remember that my view is just one of many. Luckily I don’t have a gun… and if I did I’d hide the bullets from myself. All is calm now. The hedge is tamed… and not totally destroyed. And the guy who tidied up after the gardener helped me find my cat who decided to use the opportunity to get away. Better luck next time kitty! Sometimes the way we meet our neighbours… well, I met one of my neighbours when a stranger crashed their car into my garden and my neighbours were first on the scene, sorting things out, before then… we stayed out of each others’ way, and did the same afterwards, except now we know we’re on the same hermit-like page. That 10ft hedge sounds beautiful to me 🙂 It’s nice to have neighbours sometimes… it’s also nice to have a giant hedge in between! I’ve been neglecting my tumblr a bit… kind of like the way I neglect my garden (and the hedge)… thank you for connecting here. Much appreciated!